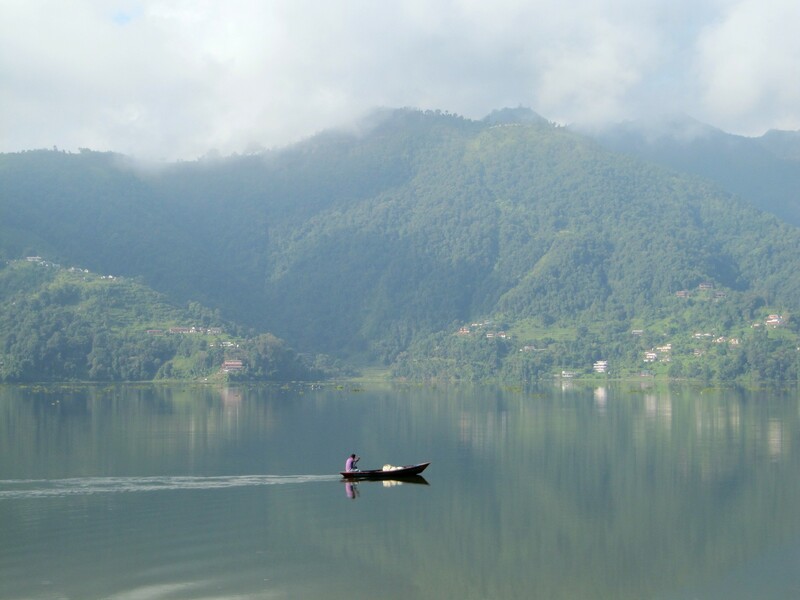 A boat on Fewa Lake in Pokhara. Had a gorgeous view of this lake for 11 days. Day 1: We arrived yesterday evening and settled into our room, which has big windows with an amazing view over the lake, and then joined the other students in the yoga hall for an introduction to the program. There is a pretty regular schedule for each day. The morning bell rings at 5:30 a.m. to awake all the students just as the sun is rising up over the hills. 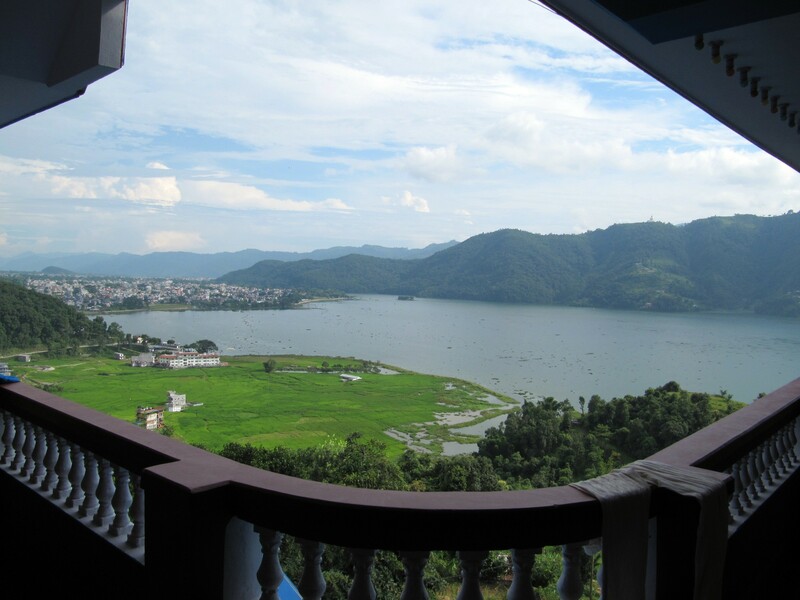 The view overlooking Fewa Lake and Lakeside Pokhara from the balcony outside of our room. 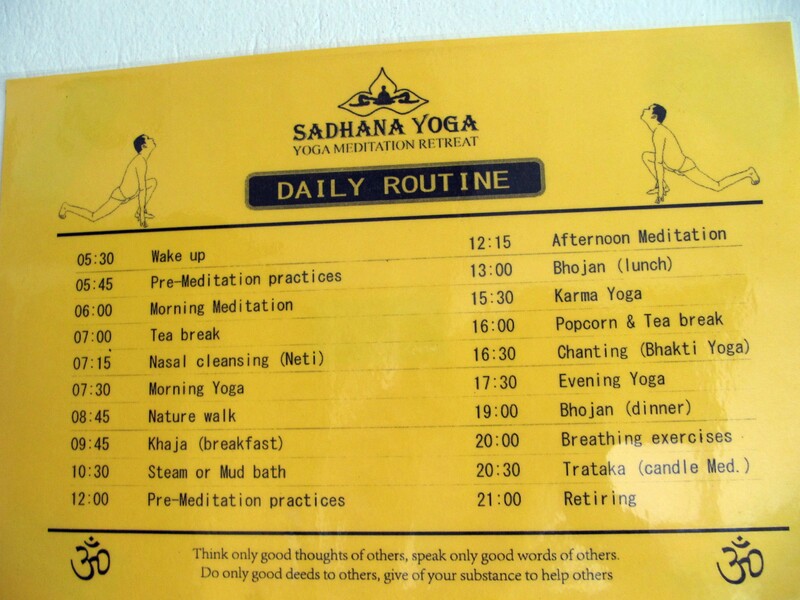 We have mediation 3 times a day: morning, afternoon, and Thataka, or candlelight mediation before bed. 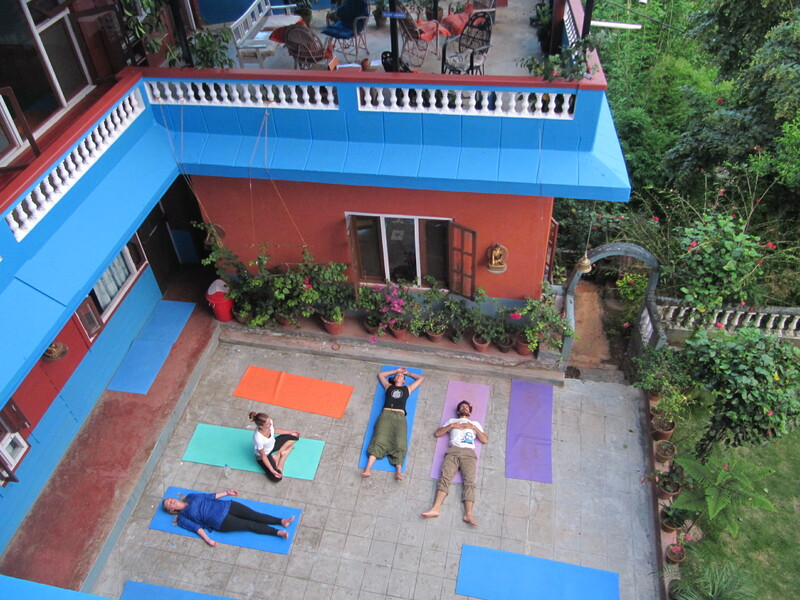 We have two yoga sessions as well as self-practice time. (The yoga is all very traditional Hatha Yoga, which was a bit slow and repetitive for me, but it was nice to try something new.) There are other activities throughout the day, including tea, lots of tea, which I love, morning ‘Neti-pot’ nasal cleansing, nature walks, a mud bath or steam bath, and ‘karma yoga’ — which means giving back, usually involving weeding the garden, watering plants, cleaning windows, or helping in the kitchen. In the afternoon we have Chanting class, one my favorite parts of the day, where we sit in a circle and sing mantras together along with drum and tambourine rhythms. At the end of day one, it feels like we’ve been here for a week. The days are long and full, and you are exhausted and ready to go to bed by 9 pm… which is a refreshing change from most of my trip so far. 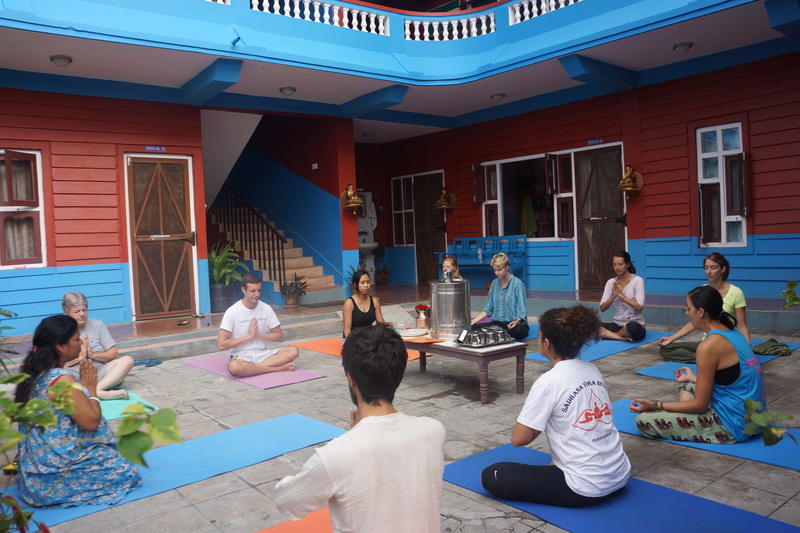 Durga leading yoga holiday students in a prayer. Day 3: Sitting in one place without moving for 30 minutes is hard. It’s really hard. Harder yet: to clear your mind of thoughts and focus on nothing. My mind is constantly jumping from one thing to the next, racing through thoughts and ideas, rehashing memories, daydreaming make-believe scenerios. So far, I’ve found that our daily Morning (6 a.m.!) Meditation session has often become my ‘Morning Thinking Time,’ where my mind has space to work out whatever lurking thoughts have been floating around in dusty corners of my head — and yes, I realize this is the opposite of meditation, but still it feels worthwhile and productive! Before this, I’ve always thought it lovely to have an active brain and I’ve quite enjoyed random thoughts and the long tangents my mind wanders off into. It’s hard to let go of them. Bippin, our eternally cheerful meditation instructor, said that a person has over 60,000 thoughts a day. Obtaining the ability to turn that off and keep the mind completely blank seems like it could be a lifelong journey and I fully admire those who can do it. For me, baby steps. I’ve considered it a small victory this past few days to narrow my thoughts down to one or two tangible things, such as only thinking about how numb my legs are and if my stomach grumbling is audible and how much time there is until lunch. I think this counts as being ‘present’ in the moment because those are the things that are presently important to my being… that’s what it means to be mind and body conscious, right? Well, at least its gotta be closer to meditating than pondering on topics like why I can’t still can’t grasp the metric system or debating who is hotter, Jeff Goldblum in Jurassic Park or Jeff Goldblum now? 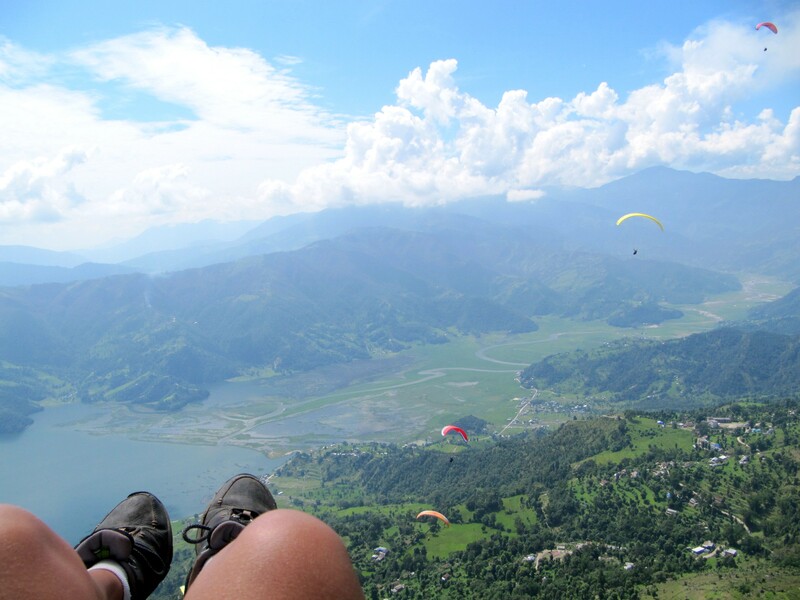 Flying high over Pokhara with nothing but a parachute and a harness and a camera. Day 5: It’s now day five and I can sit in a crossed legged position for the full 30 minutes without moving my feet around! And I think I’m actually getting better at meditating. Somewhere between ruminating on the numbness in my legs and fighting to stay awake, I’ve actually hit some pockets of ‘stillness of the mind.’ A few times I’ve caught myself suspended in nothingness — but of course, the moment you realize that you are there, it is ruined and you fall right back into a swirling mess of thoughts. 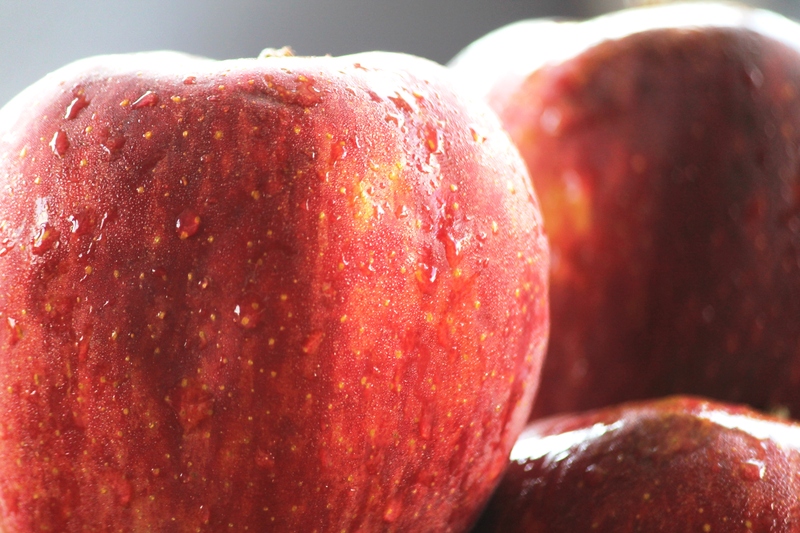 Three apples a day … is better than no apples a day! The 10-day program here includes three days of fasting: on the first day of fasting you get six apples and several glasses of honey-lemon tea, on the second day you get three apples and honey tea, and on the third day, no apples — just the honey tea. On the 10th day, after fasting is over, we do a ‘gastro-intestinal cleansing’ program, which I’ll spare you the details of (it involves chugging warm salt water, doing jumping jacks, and running to the bathroom.) After the fasting and cleansing, your system will be clean and efficient and you’ll supposedly feel amazing. On the last day of fasting, participants are asked to maintain silence. Some of the people in my group decided to remain silent for all three days of fasting. I’ve never attempted any period of silence before. At first, the idea of it sounded like it would drive me crazy in a few hours, but here was a challenge and a chance to try something new and different that I hadn’t had a chance to do before. So I decided to go for the three full days. Interestingly, I find meditation to be more difficult when I am in silence. I guess not speaking my thoughts and getting my words out throughout the day makes it harder to quiet my mind for mediation sessions. I’ve basically gone back to square one… ah well. Relaxing before a yoga class in the courtyard. So overall, I did not find silence to be very hard. After I got into it, it was pretty easy to keep quiet. I found fasting for three days while thinking about all the delicious food that exists in the world to be MUCH more challenging. Sure, there were plenty of times when I wanted to speak up, when there were conversations going on in the room that I was dying to add my opinions too — but there was something nice about sitting on the sidelines and observing everything without having or needing to partake. 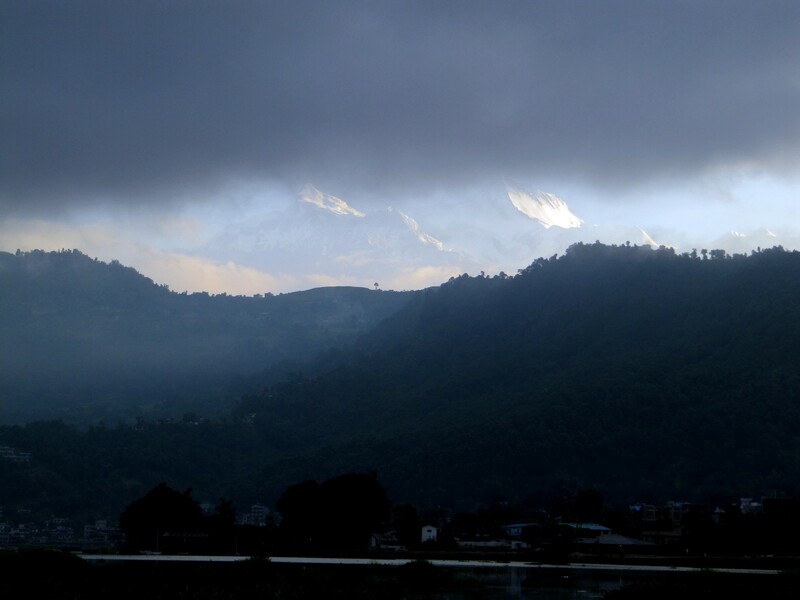 The Annapurna mountain range can be seen peeking through over the hills of Pokhara. The experience of being silent has made me think about how we choose our words and when and why we decide to speak out. Sometimes people tend to talk and talk without really saying anything — and at other times they may stay quiet when there are important things that need to be said. I learned that at times it is just fine to say nothing at all. Being silent has also allowed me to reflect on times in my life when I held back and perhaps I didn’t say the things that I should have. Now that I’m back to speaking again, I hope to be more conscious of the things I say to the people in my life, and I hope to consider more carefully the power of the words I share. Previous Post Bukit Lawang: Must Love Orang-Utans. And Rustic Jungle Jams. I don’t think I could be quiet for 3 days!! What a great experience. Looking forward to seeing the paragliding video! year are in a technological breakthrough.